During the Second World War the Navy acquired over 80 vessels within a time span of 6 years. These were primitive vessels converted from commercial ships. After the war a number of warships were transferred to the SA Navy from the British Royal Navy, including destroyers and frigates. In the 1960?s the Navy acquired three new frigates and a second hand supply ship, followed by a survey vessel. In the 1970?s three new submarines and nine high-speed strike craft were acquired. The destroyers and frigates of the Navy were phased out due to age and technical obsolescence and by mid 1980 none was left. In 1991 a frigate replacement project based on a staff target requirement approved in 1980 was cancelled before building commenced. The Navy thus entered the 1990?s with nine strike craft nearing the end of their design life of 15 years. Three submarines, over 20 years old, and support vessels and mine counter vessels were still in use. The Navy had lost its capability to operate effectively in very rough sea conditions and also the capability to operate maritime helicopters at sea. As of 1997 five strike craft were maintained in the operations cycle (three in Durban and two in Simon's Town). A sixth strike craft was involved in contractor trials. Three strike craft were in refit or reserve. Only one submarine remained in commission in 1997, and continued with trials on a new combat suite. A part of the system was proofed during a successful combat torpedo firing at a stationary target. A second submarine could not be maintained in the operational cycle due to the inability of the dockyard to complete the refit on schedule. 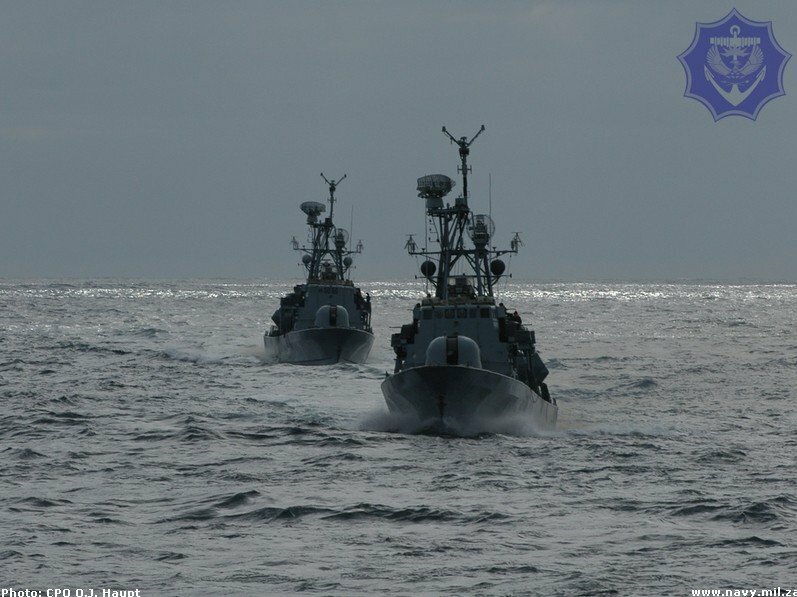 Four mine countermeasures vessels (MCMSs) (three mine hunters and one minesweeper) were maintained in the cycle. One of the hunters reverted to Class B Commission due to personnel shortages. Of the remaining MCVMs, the fourth mine hunter was in reserve, one minesweeper was undergoing refit and the other two were awaiting refit. The Torpedo Recovery Vessel completed a minor refit and was operational. The combat support ships, SAS DRAKENSBERG and SAS OUTENIQUA, were maintained in the operations cycle. SAS OUTENIQUA underwent a further stage of upgrade under Project ETNA. The 1998 Defence Review Option 1 force design objectives are reflected in the cardinal projects and long-term planning. The SA Navy is working towards achieving the approved force design within the time period dictated by the financial guidelines. The primary objectives are the acquisition of four patrol corvettes and the retention of submarine capability. Further capital projects will be launched to replace aging vessels as they reach the end of their operational life. The navy's plans for upgrading and expansion include the purchase of four corvette hulls, to be fitted with a locally manufactured combat system. The navy had planned to acquire six 800- to 1200-ton strike craft by the year 2003 and four new submarines by the year 2005, and considered the decommissioning of its nine well-worn Minister-class missile craft. Frigates or corvettes are the workhorses of any navy. They are capable of countering aircraft, submarines and other surface vessels and can conduct sustained operations in sea conditions like those off the South African coast. They will patrol to the outer layer of about 200 nautical miles (370 kms) from the coast. Such ships, as a rule, carry helicopters which significantly improve and extend their defence capabilities. The SA Navy had no ships in this class, having lost its destroyers and frigates between the mid-1970s and late 1980s. The 1998 Defence Review Option 1 included four corvettes, and eventually four Meko 200 frigates were delivered. Submarines have built-in stealth, mobility, firepower, endurance and an ability to control their visibility that present significant problems for hostile naval forces. They patrol throughout the outer and inner layers of defence, providing early warning and a great deterrent against even the most powerful of surface forces. Without submarines, a navy would have to have a considerably larger surface fleet with higher sophistication at a significantly higher cost to provide the same deterrent and defence value. The three Daphne-Class submarines in service at present are coming to the end of their economical service life and their replacement should be seriously considered. The 1998 Defence Review Option 1 included four submarines, and subsequently three Class 209 Type 1400 submarines were delivered. Inshore patrol vessels patrol the inshore waters of the maritime defence areas, primarily in the approaches to harbours. Harbour patrol boats are ski-boat sized vessels used for patrol purposes in the harbours themselves. These vessels form the inner layer of defence against smaller enemy forces that may have infiltrated through the outer defences. The 1998 Defence Review Option 1 included for two inshore patrol boats and 39 harbor patrol boats. A number of Rapid Reaction Vessels [strike craft or corvettes] should be kept on stand-by to react against enemy forces encountered by the outer layers of defence and to patrol the intermediate area. The SA Navy has nine strike craft facing block obsolescence, six of which will have to be replaced shortly after the turn of the century. The 1998 Defence Review Option 1 included six strike craft. Mine hunters and minesweepers are required to keep the harbor approaches clear of mines. The 1998 Defence Review Option 1 included four of each of these vessels, corresponding to the number then in service. However, the minesweepers, being almost 40 years of age, required a life extension program and upgrade of their minesweeping gear to make them operational. As of 2003 these Navy had two River class mine hunters which were primarily used as diving support. SAN also had one City class mine hunter in operation and a second was planned to be put into operation in the first half of 2004. The Old Ton class vessels had all been disposed of. Combat Support Ships provide replenishment at sea for combat ships and submarines, enabling operations on a sustained basis with minimal base support. These helicopter carrying ships are capable of performing multiple tasks and are vital in peace support operations because of their inherent cargo and personnel carrying capacity. The 1998 Defence Review Option 1 included one such ship. In a 2003 interview Admiral Arne Soderlund said future plans included "Probably a multi-role hull in 500 to 700 ton range that ultimately will replace the strike craft, mine hunters and patrol vessels. Also a larger multi-purpose vessel, to eventually replace the current combat support ships. But it must be versatile and capable of supporting the Fleet at sea, sealift in support of landward operations such as peace support or disaster relief and also capable of working through unprepared ports." The Mine Warfare Forces provide a capability that enables port approaches and harbour channels to be kept clear of any threat from mines or unidentified submerged objects. They are used in the first step to ensure free access to the sea and the RSA’s SLOCs. Considering the importance of maritime trade to the prosperity of the RSA, access through the country’s ports is to be ensured at all times. They also provide the clearance to the approaches to beaches for landing operations. The SA Navy is moving away from having dedicated MCM vessels for Mine Warfare operations, to acquiring a core capability, which can be expanded when the threat arises. The capability will consist of unmanned or remote controlled vehicles for mine detection and neutralisation. This capability will be operated from vessels of opportunity, therefore, dedicated MCM vessels are not required. The Navy's Chief Director Maritime Strategy, Rear Admiral Bernhard Teuteberg in November 2010 indicated the service's blueprint for 2030 forsees a fleet of 22 warships and submarines, which is less than the 26 approved in the 1998 Defence Review but more than the 18 noted in a force design approved in 2007. The blueprint provided for the current three submarines and four frigates. It then adds three offshore patrol vessels (OPV) and six inshore patrol vessels (IPV) as well as two combat support vessels (CSV, up from one at present) and three strategic sealift and sustainment (SSS) vessels (Project Millennium). Also on the list is a new hydrographic survey vessel (Project Hotel) as well as a mobile hydrographic survey team. By 2011, with the SAN’s Strategic Defence Package programs approaching completion, having operationalised four Meko 200 frigates and delivering three Class 209 Type 1400 submarines, the focus of naval acquisition was directed towards upgrading and sustaining the Navy’s patrol vessel, hydrographic vessel and submarine torpedo replacement capabilities. Phase One of the underwater range was completed and handed over to the project team. The Westland Super Lynx Maritime Helicopter was successfully integrated into the SAN Meko 200 frigates. Three surface frigate-size combat vessels – able to upscale to six frigate-size combat vessels. Two conventional submarines – able to upscale by an additional submarine. Two Combat Support Vessels – able to upscale to an additional Combat Support Vessel. The extension of the Navy’s area of operations to include the Mozambique Channel and its approaches, and the likelihood of a further extension to counter piracy along the west coast of Africa, requires urgent acquisition of a second combat support ship to enable frigates and offshore patrol vessels to be employed efficiently. That ship must be followed by replacement of SAS Drakensberg, which has been in service since 1987. One strategic force projection vessel for inter-theatre and intra-theatre personnel and cargo sea-lift for motorised and mechanised forces, able to multi-role for seaborne command and control, combat service support and hospital services – able to upscale by an additional strategic force projection vessel. In the medium term the focus is to be on acquiring Sealift ships for the SA Army’s sea-landed infantry capability and to acquiring additional Combat Support Ships. Sustain provision of two maritime off-shore patrol vessels, with two off-shore patrol vessels on continuous deployment. Sustained provision of six maritime in-shore patrol vessels aligned with major ports. with the adoption of the ‘back to the borders’ policy by the government, under which the South African National Defence Force (SANDF) has been reassuming responsibility for patrolling of the country’s borders from the South African Police Service. As the country has a maritime frontier as well as a terrestrial one, this has affected the SAN as well as the army. South Africa has an Exclusive Economic Zone (EEZ) which extends for 200 nm (370.4 km) from the coastline and in which the country has control over all natural resources, in and under the sea. South African territorial and EEZ waters include those around the islands of the Prince Edward group (Prince Edward and Marion), which lie some 1,769 km south-east of the Eastern Cape. The new border policy has increased the number of patrols the fleet has to conduct. The spread of Somali piracy to the northern Mozambique Channel, resulted in Mozambique, which was unable to meet the threat on its own, requesting naval and air support from South Africa to secure these waters. South Africa’s frigates are now, on a rotation basis, maintaining a permanent presence in the northern Mozambique Channel. The South African Navy was very instrumental in drafting the maritime strategy and carried the bulk of the costs. African countries bordering the Indian Ocean do not have the same resources and financial means to deal with maritime insecurity. The SADC Maritime Security Strategy (MSS) does make provision for the creation of capacity, within all member states, to contribute constructively to the eradication of maritime insecurity within the sub-region. As Denel got ready to revive the Naval Dockyard facilities in Simonstown, the company was collaborating with thyssenkrupp Marine Systems (tkMS) for joint support of the SA Navy frigates and submarines. Denel, which is a global supplier of world-class defence products and solutions, and tkMS, signed a memorandum of understanding (MOU) on-board the SAS Amatola, in Rostock, Germany 13 March 2017. The co-operation is based on the recognition of the critical importance of the operational availability of the South African Navy Fleet at all times. Denel's Maritime division took responsibility for maintenance and upgrades on three heroine-class submarines (SAS Manthatisi, SAS Charlotte Maxeke and SAS Queen Modjadji) and four valour-class frigates (SAS Amatola, SAS Isandlwana, SAS Spioenkop and SAS Mendi). The vessels were commissioned by the SA Navy between 2005 and 2008. The agreement created a framework in which tkMS, the original manufacturer of the submarines and frigates, will provide technical and shipyard support as subcontractors to Denel. It will include quality assurance and procurement, on-site technical support, the transfer of technology and the development of the local supply chain. The training of Denel's technical personnel will take place in Germany. As the original equipment manufacturer (OEM) of the South African Navy (SA Navy) MEKO A-200 frigates (valour-class) and the SA Navy 209/1 400mod submarines (heroine-class), tkMS will provide general support with regard to the Dockyard operations, infrastructure, and maintenance. In addition, the company will provide technical support for maintenance, repair and overhaul (MRO) of the frigates and submarines in the Dockyard, with all activities focused on ensuring that the SA Navy ships are able to spend maximum time protecting South Africa's maritime territory. This is a major boost for Operation Phakisa, government's broad strategy to develop the ocean economy and unlock the potential of the country's vast coastline. The experience Denel gains on the pride of South Africa's naval fleet will soon become available to other state-owned vessels and enable Denel to expand into the commercial sector over the long term. The agreement with tkMS forms part of Denel Maritime's strategy to establish key strategic alliances in the maritime sector.